Sorry for such a long intro, just wanted to inform you I’m back now (and how last few posts were set to automatically appear each day, and were written few days ago ;). It’s also why it took so much time to get your comments approved. Now that I have charged my batteries once again, let me roll up my sleeves and continue sharing some good stuff! For today I bring you two posters that feature Missing Pieces illusion we featured some time ago. Seems that Chupa-Chups company jumped the optical illusion billboard wagon as well! the 64=65 one is similar. they just don’t line up. I can’t work this one out. It’s like the bottom one is smaller by a tiny bit because I’ve counted the blocks and lines and they’re both the same. Thats for the second one. As for the first one isn’t it just a stupid math error? Nah. It isn’t a calculation mistake. the reason behind the different area is due to the arrangement of the figures. the exact mathematical reason, I am not so sure. But I am sure it works, I saw it before somewhere. My brain just refuses to deal with this! http://www.youtube.com/watch?v=ee0dksxkog0 and many other sites explain this illusion. The pieces from the first puzzle do not fit together tightly in the second puzzle. In reality there should be a skinny gap along the diagonal to account for the extra square. The heavy black line covers this gap. 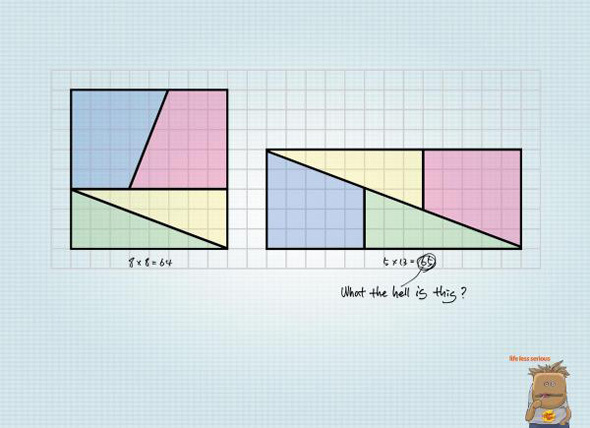 Calculate the slopes of the diagonal edges of each piece and you will see they are not the same. Attached is a more precise version of “Chupa-Chups Missing Pieces” to show how it is done. The pieces from the first puzzle do not fit together tightly in the second puzzle. In reality there is a skinny gap along the diagonal to account for the extra square. The heavy black line covers this gap. Does anyone know how to send in illusions…? Because I found a pretty good one (form another illusion) and I don’t know how to send it in. That is helpful, but it isn’t strictly to do with this illusion. More of it’s own separate thing. I wanted to send it to Vurdlak because I’, not sure if he checks all the comments. Thanks, though! Folks. This month’s (May-June 2011)edition of Scientific American has an entire section dedicaled to Illusions along with links and some DIY articles. they both work on the illusion of the shapes not being entirely what they represent. All I have to say is… What the hell!!!! Ah yes the old chessboard paradox. Visaully striking, Fibernachie number serices issues. But simpy the diabonal angle of the 4 sided pieces is just not the same as the diagonal angle of the the three sided pieces. So the apparently stright line ( or diagonal) through the long rectangle is simply not one line, there is a “void” in the middle and it accounts for the “extra” block or apparent extra block. 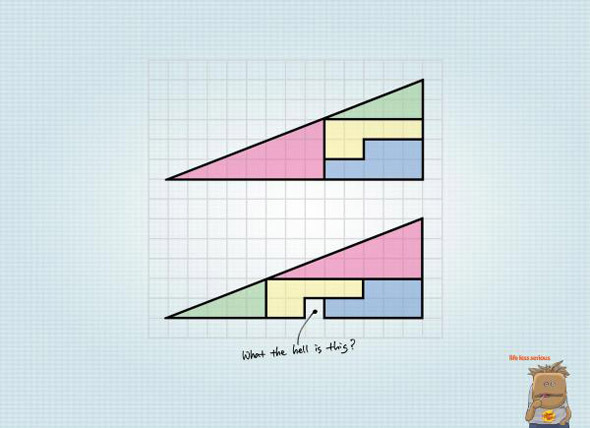 One of the only examples where the algebra I skill of finding slopes is useful in the world of optical illusions. Different shapes can make different shapes. Lol. Reading Danny Dulai’s suggestion, that makes sense! Draw it in a cadd program and it’s perfectly clear. They aren’t the same size. The difference is subtle but distinct when dimensioned. It’s just like an architect’s drawing: If it doesn’t quite fit, use a different line weight. They’ll figure it out in the field. The first figure works cause of the arrangement of the figures. If you were to arrange them in real, you will discover a small spacing, a quadrileteral with area = 1cm(2). Hence, it will have a different area. It is not a calculation error! The second one is basically the arrangement of the figure that causes the hole. Danny Dulai(third commentor of this post) has a link to the full explanation. I remember this from school, though the working example was different – an 8 x 8 slab of cake, that needed to feed 65 people. By chopping and arranging like that, before chopping again, you’d actually get a reasonably fair distribution of cake. i feel like i dont have a brain when i look at that! who else thinks so?! The cosines of the smaller angles of the two tringles are not equal. hence the smaller angles of the two triagles are not equal.This proves that the line opposite the right angle of the combined figure is not a straight line. yes in the first puzzle ideed it is 13×5=65. no other way to look at it. You guys are argue too much! Guys guys guys, the 2nd one is so freaking easy, on the top part, notice how the yellow brick was places ON the blue brick. By on the one below, the yellow was places BESIDE the blue brick. But why do they both have the same length? Because the green and red brick changed sides.